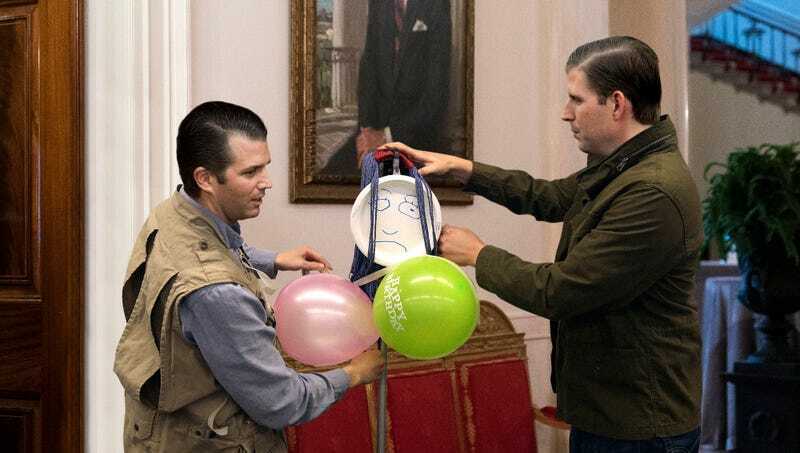 WASHINGTON—Adding the finishing touches of two earrings made of twisted paper clips and a mop head hastily colored brown with magic marker, Donald Trump Jr. and Eric Trump spent several hours constructing a life-sized fake Melania Trump for their lonely father to spend time with, White House sources confirmed Friday. “There, that’s perfect—Dad’s gonna be so happy to have this new Mommy to be married to until our old Mommy comes back,” said Eric Trump, drawing his best approximation of Melania Trump’s facial features on a paper plate while his brother stapled a floor-length Dior evening gown to a stack of throw pillows roughly the height of the absent first lady. “We spent a whole bunch of time on it, and it definitely shows. I bet Dad won’t even be able to tell the difference.” At press time, the Trump boys were duct-taping a paperback copy of Animorphs #28 to the doll’s inflated rubber glove hands in preparation for story time.